Remember when you had that dream about performing onstage with one of your all-time boy band faves? American Crime Story breakout star Darren Criss actually got to *live* that. JC Chasez and Darren Criss sang *NSYNC songs together, and it’s safe to say it’s tearin’ up our hearts. 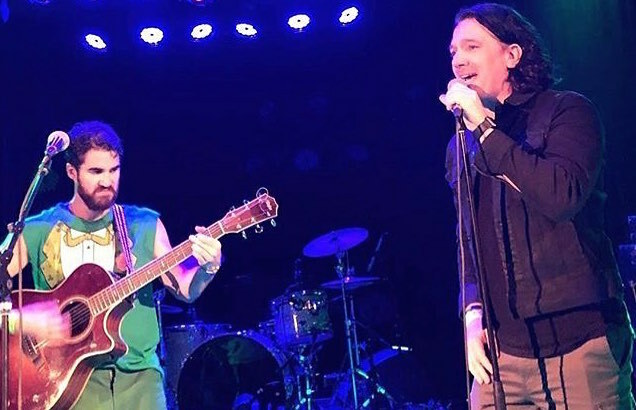 JC Chasez and Darren Criss performed multiple *NSYNC hits together at Criss’ St. Paddy’s day show in Los Angeles. Yes, Criss pulled Chasez up onstage, and not the other way around! During an “intimate set” at the Roxy Theater, Criss brought out Chasez for some throwback jams. Did some genius fans whip out their phones in time to grab video? They sure did. Someone’s gonna flip out, and it’s gonna be me. God must have spent a little more time on this video. Space cowboy reference? That one’s harder to work in naturally. But wait, there’s more! A Darren Criss Twitter fan page posted a closer-up shot of the two dreamboats rockin’ out to ’90s hits. Our hearts are aflutter with this dirty pop celebrity surprise. The truth remains: Our chill is gone. We feel like it’s Friday night, and we just, just, just got paid, except better, because Chasez appeared out of nowhere at an intimate Criss show, and played acoustic renditions of NSYNC songs with him and you can’t put a price on that. This video has fans’ whole hearts, no strings attached. Hang on, did you not get enough? Your heart desires more footage of JC Chasez and Darren Criss singing “I Want You Back” and “Tearin’ Up My Heart”? The performance is all you ever wanted, nay, needed? You’ll never get tired of *NSYNC jokes in this piece? Great! Enjoy piping hot content, fresh from a surprisingly active fanpage dedicated to Chasez on Instagram. Truly, spring hath sprung. Let this glorious footage melt the ice around your frozen, wintry heart. *NSYNC forever. Also, does anyone have a lead on Darren Criss’ amazing shirt? Because we need that for next year’s party.